Welcome to The Sound Shop. 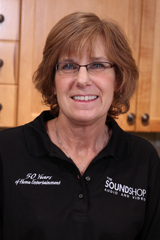 I’m Patty Jakos, President of the The Sound Shop. 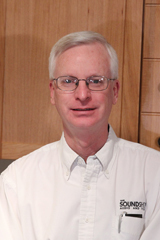 I took over ownership from Larry Powers in May of 2012, and although he will no longer be responsible for daily operations, he will continue as my trusted advisor and consultant. I’ve worked for Larry forever, and that’s a really long time! I’m a home improvement addict, so I love the design aspect that has worked its way into audio and video over the last few years. Manufacturers have finally realized that style and substance can co-exist! I’m also a fan of universal remote controls that “ keep it simple” and really big TV’s for watching sports & movies! I’m Kelly Miles, and I have been in the music business since my family opened their first piano & organ store in Oklahoma, back in 1967. I moved to Colorado Springs with my wife for her job as a high school administrator and coach. 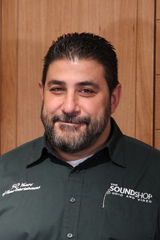 I’m coming up on my 20th year with the Sound Shop. It’s been fun seeing the changes in our industry over the years. I enjoy 2 channel stereo, but also enjoy home theater with my wife, daughter, and our Lab. I have always said that being at the Sound Shop is not really a job, but a hobby. Give me a call to come to your home for a free consultation on all of your audio and home theater needs. I’m Scott Alamo. I was born in Colorado and have been here the majority of my life. I have been doing business with The Sound Shop for over 15 years. First I was a customer, and then became an employee. My first love is my family, my second is music. There are a lot of different styles of music, but the one I prefer is metal. Yeah, like that’s music… but I LOVE IT! I like listening to vinyl, and also multi channel music. My third love is sports, my favorite being football. Go Irish, Go Raiders!!! There is nothing like watching football in High Definition. Stop in and we can talk sports or music!